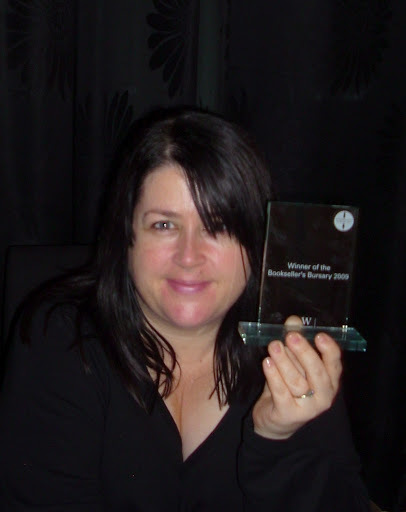 I received my prize for winning the Bookseller’s Bursary yesterday. Wow, what a parcel! 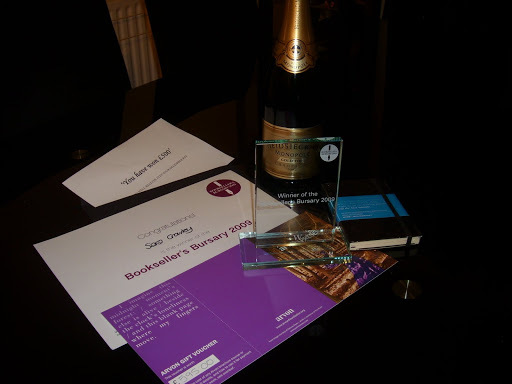 Champagne, a trophy, £’s, an Arvon gift certificate, a winner’s certificate, an Arvon Moleskine notebook. Superb. I am chuffed to bits. And I wasn’t going to say anything, because y’know, it doesn’t do to show off. Then I thought, oh hang on a minute, I’m quick enough to share things that make me miserable. It’s funny, I have an uncomfortable feeling of wanting to tell people that I have had some good news, mixing with huge embarrassment. I didn’t tell many that I was on the short list, I wasn’t going to mention it in fact. So when I won I had this conversation with my mum and a few others. “Oh, erm, there was this thing…” mumble, mumble. I was squirming, not sure why. Haven’t heard a word from my dad (who lives with my mum) and when we spoke on the phone he didn’t mention it. Both my brother’s are on facebook but they haven’t mentioned it either. My husband is pleased but hasn’t read a thing I’ve written for years. Anyway, I decided to brave this out and announce publicly that this is quite the nicest thing that has happened to me in ages. I am thrilled with my prize. Thank you to Waterstone’s for being so incredibly supportive of the many writers it employs, and thank you to the judges from Simon & Schuster, Arvon and United Agents. I’ll shut up now and hope you can forgive the showing off. Next Post Disappointed by the Waterstone’s bashing. Good. Good good good that you are sharing the great stuff with us as well as everything else!!! And what great stuff!!! Re family, if you mumbled they probably didn't get it at all… but family is annoying, anyway, so let us go WHOO-HOO for you instead!!! Sara rules! Huge congrats. What fun! Champers! wow, brilliant, very well done to you x! Aww, you are all lovely! I feel unfamiliarly warm and fuzzy.Vanessa – yeah, weird how we can say oh we got rejected and it really hurt and so on, but saying we won kinda sticks. Let's be loud and proud!And thank you for the lovely things you said on your blog about my writing. I may well swipe them and use it as a quote here! Not gonna comment on that thread though, suffice to say I heartily disagree with the Guardian article. Tania – I am loving those Whoo-hooo's! So glad you did share this. It's inspiring to read. Well done you! You show off as much as you like. You have won this by talent and determination. It is inspiring for other writers, especially with us slogging on the NaNoWrMo path….. I have been neglecting you and I haven't even congratulated you on winning this award. So warmest congratulations, and I do hope that I will be able to walk into a branch of Waterstone's one day and buy a book written by you. That would be so great. Sara, I'm sorry for coming to the party so late, but I am thrilled for you.Honestly, any writer's good news, particularly a woman writer from our community, feels like good news for me too. It's inspiring and exciting all round, so good for you for sharing and for allowing us to celebrate with you. Enjoy. Enjoy!Funny, I too feel like I have so few people to share my writing with, my family and husband never read my work. Thus there's few with whom to share the odd high of recognition and the many lows. That is one of the greatest gifts this community has given me: I don't now feel like it's just me and the writing and the walls.Congratulations again. Beth – thank you. Yes, must write, write, write!Rebecca – thank you for dropping by. I will email you.Fia, Julia, Emma – thank you so much. It's so nice that people have been happy for me. And it's lovely to share good news. I want more good news!Ethel – thank you! Yes, this writing community is so important isn't it. Interesting to hear that your family don't read your work either. It can be incredibly solitary as you say, so hurray for online writing chums. Congratulations! I am a little behind on my blog reading due to professional obligations. But I am very happy for you. That has to be a shot in the arm. There is nothing quite like positive feedback. You show off as much as you like: it's well-earned! And Vanessa's right – in fact, I'd say it's even more important to share good news than bad (but am ex-Brit …!). Congratulations, Sarah.